Being laughed at is one of the worst humiliations that exists. Someone picks you out as the target of ridicule and the spectators laugh with him. They exclude you from the group. Like a pariah. Those who laugh do it out of fear of being rejected themselves. Laugh or be laughed at. Another form of humiliation is being spoken to about mistakes in front of others: “Why did you do so poorly on your test?” “You’re not very intelligent, are you?” And wham, you feel the humiliation. You can choose: either get mad or keep your mouth shut. Most people choose the latter: you lie low, keep your mouth shut and just try not to get noticed. If you’re smart, it’s better to get slightly lower grades. If you’re sensitive, you should keep your distance and be alone. That way, at least they can’t hurt you anymore. Why does the bully bully? People’s biggest fear is being excluded. What causes people to laugh at others or publically humiliate someone? Especially “publically”, because otherwise the bully has no power. And here’s the crux of the matter: a bully bullies because he feels threatened by your presence. Because you are different, because you are smarter, because you get more compliments while they are being denounced as being dumb. It hurts them when other children get new things more often, have nicer parents, etc. It irritates them that you are different, have other clothes, find other things important. They don’t understand you. For the bully who feels threatened, enough reason to attack you. I call these bullies “fear biters”, just as with frightened dogs that suddenly bite when they are afraid and feel threatened. Why do adults bully each other? In the adult world, bullying is just as tough but more subtle. The bully has the need to feel big because he feels small. Maybe he was once bullied himself? The adult bully pushes people down. With innocent teasing and taunting. During a party he makes a joke at someone else’s cost, sometimes to the point of mean teasing, such as accusing someone or raising suspicion about them. Characteristic is that there is a group of people who laugh with him/her, which surrounds the bully with a group that empowers him/her. It’s too much to handle for the person being bullied. It’s take it or get away from it. Sometimes an entire agency or organization functions as a bully towards people who are left out or humiliated. The person being bullied often has a seriously weakened heart. You can still remember it and the feeling that you can’t trust people is written into your soul. No one is able to change your mind. Being bullied usually means suffering and never again living with an open mind. During coaching and therapy it usually becomes crystal clear just how deep the wounds of the bullied person are. In addition, there is the group of followers. The ones who laughed together, their fingers pointed at you. Those who thought that it was funny and that you could take it. They were suddenly very quiet when the bullying was brought to light. These followers now know, as adults, what they were involved in. They realize how cowardly they were, how mean they were to make another person miserable out of fear. They could have acted differently; they just didn’t dare. Out of fear that they would become the next target. Exclude or be excluded. And there is a third group, the bullies. People, who used to be bullies, live in pain. They know what they did; they remember it still and, deep in their hearts, are very sorry for what they did. Usually they were jealous or angry, but why exactly? It’s a part of themselves that they usually keep hidden. It is, after all, “not done” to admit that you used to be a bully. These people usually spend the rest of their lives living with a feeling of guilt. Hoping they never see their victims again. Especially not as their dentist! All 3 groups need healing. The bullied person, as well as the followers, as well as the bully. All three are still victims of what happened back then. Thankfully, there are many ways to heal yourself and let go of the old pain. The MIR-Method is one of those ways. When a bullied person does the MIR-Method, he erases the old pain, layer for layer. The feelings of grief, resentment and victimization disappear and the bullied person can eventually forgive the bully. That usually happens with step 3, ”Detach father. Detach mother”, when the bullied person detaches the bully out of his system. 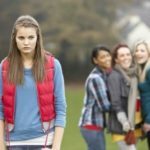 Important: if you are being bullied at the moment, the MIR-Method can help you to stop the bullying by changing you from the inside out and making you stronger! The follower heals his shame and becomes stronger as an individual, so that being a follower is the last thing he would ever want to do again. The follower becomes insensitive to peer pressure. The bully, lastly, heals his feelings of guilt. He can’t forgive himself or feel that the bullied person has actually long since forgiven him because the bullied person always knew already that the bully acted from his own pain and lack of power. Your biggest fear is that you are powerful beyond measure! “Our biggest fear is that we are powerful beyond measure!” This sentence is familiar from a beautiful poem from Marianne Williamson. And I’m beginning to understand it. When people are bullied, it’s almost impossible for them to stand in whom they are. There is too much risk. When you do the MIR-Method, you let go of your sense of danger. You begin to feel free to be smart, to be dramatic, to dance, to excel at sports, to sing freely! You dare to be different, to radiate and to take leadership! May I you ask for this dance? For the dance of your life? The singer Adele wrote a fantastic song, “Make You Feel My Love”, that I’d like to dedicate to all bullied persons. Maybe you can feel a little bit of my love through it. That your heart, your self-confidence, your Being can heal completely! Because if you realized what’s inside of you, then you’d understand why I’m trying so hard for you! P.S. If you would like to react to this, feel free! Let me know how it is for you. You can write your reaction below. P.S. Please share this article with your friends. You can use the icons below for Facebook, Twitter and e-mail. Thank you! I truly appreciate your article on bullying – it is a crucial, critical and horrid issue that must to be addressed and must be stopped. Being close to retirement age, I have a somewhat different story which may need to be addressed somewhat differently. Like the bullying survivors you wrote about, I was, of course, held up for ridicule at every opportunity, trapped into unwinnable situations, and completely ostracized by my school mates and peer group, And not just peers, but teachers, parents, practically everyone I encountered during my primary education. But in addition to the more typical humiliations and psychological damage you address, I was regularly physically beaten beyond recognition by these bullies – whether at school, on the streets, or at the hands of my own parents I was mercilessly beaten by bullies of all strains. None of my teachers or relatives intervened or tried to protect me in any way, they were far more likely to abuse me. After a time, I naturally internalized all of this, thinking that I must have done something terrible to deserve it. Despite much effort by many people, these are the sorts of things that never leave one’s psyche, and prevent one from living a full, or at least normal, life. For 12+ years, I lay awake at night wanting to die rather than face the humiliation and beatings that awaited me the following day. And none of my teachers or relatives intervened or tried to protect me in any way, they were far more likely to abuse me. I lay awake at night wanting to die rather than face the humiliation and beating that awaited me the next day. These scars have robbed me of my life for over 55 years, and no modality has gone untried – the MIR method, the tapping solution, spiritual guides, energy healers, CBT, psychiatrists and psychologists, not to mention my 50 years of regularly practicing yoga and meditation. And none of these modalities have been able to return me to the person I was meant to be. Do you have any suggestions, And are there advanced MIR techniques that may be of help? Thank you so much for your insightful article, and for addressing the very serious topic of bullying, and for all you do. Such a sad story you have to tell… it’s heartbreaking. In those days people somehow just froze when they noticed someone was beaten and didn’t act. Or they might have thought what you thought in the end: that you deserved the beating. Because beating was back then a way to disciplin children. I am very sorry to hear how hard your life has been. And… I am glad that you are still with us! So many bullied people end their lives, understandably. If you do the MIR-Method, you can try several other things. You can try to forgive yourself for believing you deserved it. Place your hand on your heart while doing the 9 steps. And whenever you have a nightmare or you relive a fragment of the past, do the MIR-Method First Aid. It is in the Additional Techniques. Besides that, you could book a consultation with a MIR-Method coach. They know techniques to get rid of old useless emotions so that your emotional world can feel free. Hope you can have some lighthearted years ahead! I appreciate this article, especially the mention of the MIR-Method. I’ve been bullied upwards of five years now, simply for the way I smell. “Well, start washing more frequently”, I hear you say, and I have done that, and yet it doesn’t stop. I truly hope you will benefit from the MIR-Method! And yes, it takes some time for it to work, so thank you for understanding it will help you in the long run. Though several people have reported miracle changes, but usually it is over a longer period of time. Thank you for embracing the MIR-Method and I hope the bullying will stop soon! I am very grateful for your gift of this article today. Yesterday my husband and and I where actually talking about bulling and about leaders intimiding their own people. I really feel strongly about this subject and now understand why. My own father Was and is a bully as well. Love, BLessings and Healing to you always Mireille. I am SO happy for you about what you suddenly realized about your father! This is exactly why step 3 can be so important! It is one of the things that make people hide all their lives. I hope for you you can heal it all inside and you will flourish again! Thank you for this beautiful article. I am doing the MIR-Method for 4 or 5 months now and this was the piece of the puzzle I was still missing. I never realized that being bullied had such an impact on me. After reading this, I realize that this has been a theme throughout my whole life. I was bullied as a child, but also as an adult. I never understood why, but was always very alert and suspicious of people. I didn’t get that and could never relax. Now I see it is because of the bullying! Because of this insight I can let it go now, be who I am, although nobody understands anything about me (that is the reason I was bullied I guess). From the deepest of my heart, thank you for this insight. I am very happy to hear how this article touched you! May you let go of all that bullying from the past and really radiate again! And I am very glad that you are different!